Weblate organizes translatable content into tree like structure. 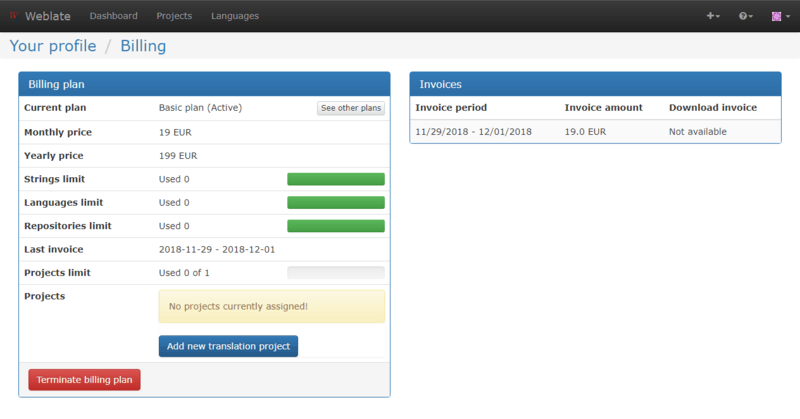 The top level object is Project configuration, which should hold all translations which belong together (for example translation of an application in several versions and/or documentation). On the next level, there is Component configuration, which is actually the component to translate. 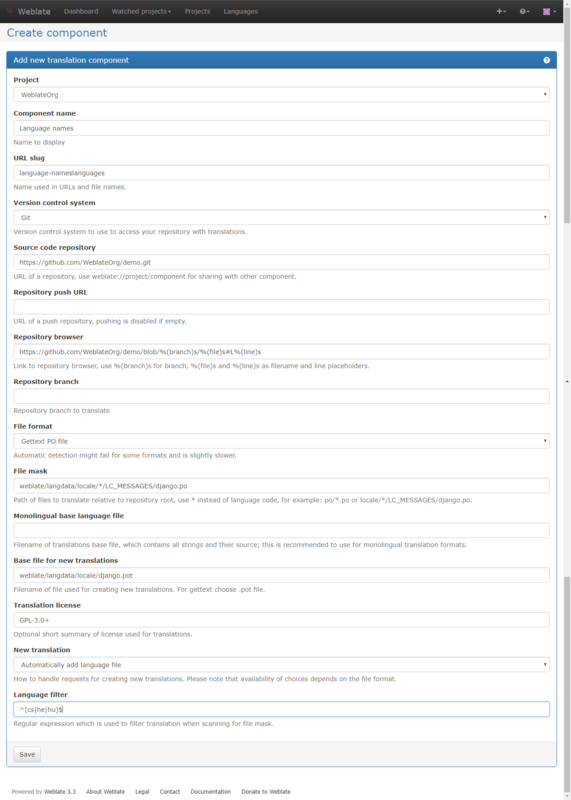 Here you define the VCS repository to use and mask of files to translate. Below Component configuration there are individual translations, which are handled automatically by Weblate as the translation files (matching mask defined in Component configuration) appear in VCS repository. Weblate supports wide range of translation formats (both bilingual and monolingual) supported by translate toolkit, see Supported formats for more information. Changed in version 3.2: Since the 3.2 release the interface for adding projects and components is included in Weblate and no longer requires you to use Django admin interface. 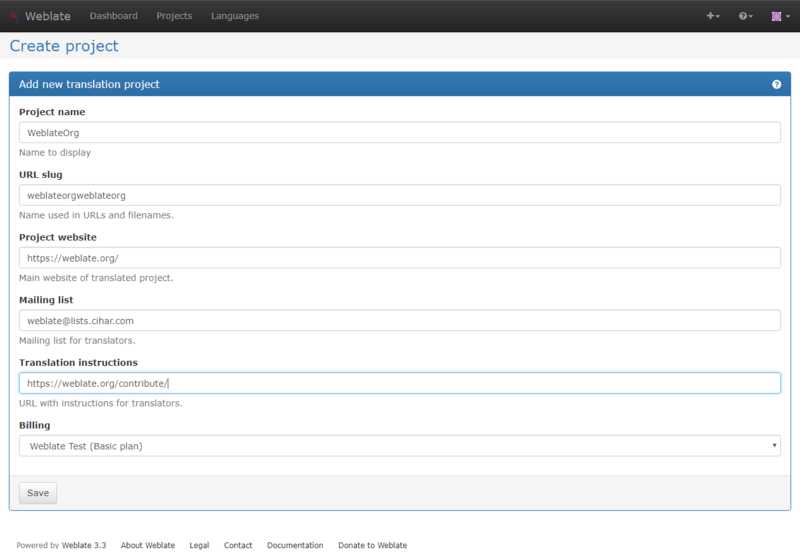 Based on your permissions, you can be able to create new translation projects and components in Weblate. It is always allowed for superusers and if your instance uses billing (eg. like https://hosted.weblate.org/, see Billing), you can also create those based on your plans allowance. Base file used to generate new translations, eg. .pot file with Gettext, see Adding new translations for more information. Message used when committing translation, see Template markup. Weblate uses simple markup language on several places where text rendering is needed. It is based on The Django template language so it can be quite powerful. Translation stats, this has further attributes, see below for examples. If you are importing huge translations or repositories, you might be hit by resource limits of your server. In case you have project with dozen of translation files (eg. for different Gettext domains or parts of Android apps), you might want to import them automatically. This can be either achieved from command line using import_project or import_json or by installing Component discovery addon. For using the addon, you need to first create component for one translation file (choose the one that is least likely to be renamed or removed in future) and install the addon on this component. For the management commands, you need to create a project which will contain all components and then it’s just a matter of running import_project or import_json. Fulltext search is based on Whoosh. It is processed in background if Celery is configured. This leads to a faster response of the site and less fragmented index with the cost that it might be slightly outdated.